The Death of Her is a haunting psychological thriller from Debbie Howells, author of the bestselling Richard and Judy Book Club success The Bones of You. A woman’s body is discovered on a Cornish farm, battered and left for dead in a maize field. Airlifted to hospital, her life hanging in the balance, no one’s sure who she is. Three days later she comes round, but her memory is damaged. She knows her name – Evie – but no more, until she remembers another name. Angel – her three-year-old daughter. As the police circulate Evie’s photo, someone recognizes her. Charlotte knew her years ago, at school, when another child went missing. Leah Danning, who vanished whilst in Evie’s care. When the police search Evie’s home, there’s no sign of Angel. More disturbingly, there’s no evidence that she ever lived there, forcing the police to question whether Evie’s having some kind of breakdown. Debbie self-published three commercial women's fiction novels before writing The Bones of You, her first psychological thriller. 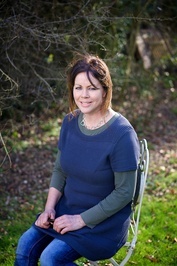 She now writes full time from her home, in a small West Sussex village where she lives with her family. As a huge fan of the first book from this author, The Bones of You, I was extremely excited to receive a copy of her latest release courtesy of the Publishers - a big thank you to them from me! And I wasn't disappointed as this new book kept me turning the pages and found it difficult to put down! Prepare to have your emotions played with when you read this!! The author has done another amazing job of constructing a storyline that draws you in, packed it with characters you don't know whether to trust or be wary of, and leads the reader on a thrilling journey as the plotline unfolds! When a woman is found battered and alone in the middle of a quiet village in Cornwall, the quest is on to find out what happened to her and what happened to her daughter Angel who is now missing. And all she can remember is her name - Evie - and very little else which makes putting the pieces together very difficult. Charlotte is a local who recognises Evie from a photo she sees online, but she remembers her as Jen from school! She starts spending more time with Evie at the request of the police officers involved in the case, in the hope that an face from the past will help unlock her memories. But as the memories slowly return, more troubling revelations follow. And just where is the trace of Evies' daughter, Angel?! No clothes, no toys, no photographs - maybe her amnesia is making her believe something that never happened? And when men with torches are spotted in the woods at night, is there something far more sinister going on, especially as a child went missing a number of years ago and was never found? I really enjoyed the multiple Points of View we have in this book! The characters we hear from each have their own strengths and weaknesses, so your opinion is changed at regular intervals . The timeline also delves into the past and it is fascinating to hear from such a dark and tortured soul with their views and how that impacts on the now. The pace is quite steady throughout which means you keep turning those pages, and I didn't feel it drag at all and have to confess to reading it in 2 sittings out in the garden as I just wanted to know how it all ended!! The vulnerability of the characters also worked really well and added to to the intrigue! Another absorbing story from Debbie Howells and I can't wait for more!! My Bookish Weekly Wrap Up!